As a leading Buddhist country in the world, the Buddhists of this country should seriously consider requesting the Government of Sri Lanka to issue a commemorative postage stamp in honour of Dr. B.R. 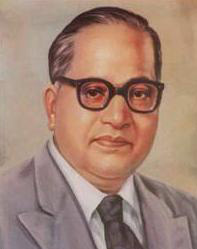 Ambedkar, for the great work he has done for his people and the cause of Buddhism in India. There are nearly 250 Million Dalits in India which is virtually 1/4th of the Indian Population. Sri Lanka should befriend these people. Buddhism can cement ties between Indian Dalits and Sri Lanka. Mayawati, the Chief Minister of Uttar Pradesh, is a staunch Buddhist. She heads the Bahujan Samaj Party, which represents the Bahujans or Dalits, the weakest strata of Indian society. This is her fourth term as Chief Minister of Uttar Pradesh. She is an icon for millions of India’s Dalits. She is sometimes referred to as Behen-ji (sister). With a population of over 200 million people, Uttar Pradesh is India’s most populous state, as well as the world’s most populous sub – national entity. Uttar Pradesh (UP) is the second largest state-economy in India, with a GDP of $103.5 billion in 2009. The annual per capita GDP of the state was $1586 in 2009. It contributed 8.34% to India’s total GDP in the financial year 2010. UP also has several sites important to Buddhism: the Chaukhandi Stupa marks the spot where Buddha met his first disciples, while the Dhamek Stupa in Sarnath commemorates Buddha’s first sermon. Further, the town of Kushinagar is where the Buddha attained Maha Parinirvana. Sri Lanka should invite Mayawati to visit Sri Lanka and in turn seek the strengthening of economic and religio -cultural ties between Uttar Pradesh and Sri Lanka, The Buddhist World must give her recognition outside India. The example of Ambedkar embracing Buddhism should be given the widest publicity in the North and East ( as Gamini Gunawardena has suggested) to motivate the so called low caste Tamils in these areas and the Hill Country of Sri Lanka to pursue a similar path. Buddhism teaches equality. This was Dr. Ambedkar’s message to his fellow Dalits. Indian Dalits who are Buddhists (in the absence of Dr. Ambedkar) may well spread that message among Tamils in Sri Lanka who feel persecuted and oppressed by members of the higher profile Tamil castes. Dr. Ambedkar’s inspiring legacy may well play a bigger role in Sri Lanka’s efforts at reconciliation between various communities.